When you print a web page, you usually go through the Print command of your web browser; when you are checking your Yahoo Mail emails from a browser, printing an email this way will not work, and print instead the entire web page - not what you had in mind. In this tutorial, we will show you how to print an email the right way inside Yahoo Mail - both how to print the selected email from the Inbox tab (or another email folder in which you happen to be), as well as printing the email from the email tab itself. We will also quickly cover why print preview is currently not possible inside Yahoo Mail. Depending on how you read your emails, you may have opened either the current folder tab, wit the full listing of emails and the content of the selected email visible inside the Reading Pane (as shown on the screenshot below), or have the email opened in its own tab. When you read your emails inside the email folder view, the tab will display the current folder name. We will now show you how to print an email from this view. If you click Cancel to hide the Print dialog, the window will automatically close, so there is unfortunately no way to truly use Print Preview for Yahoo emails the way you normally do with a web page. The best alternative is to simply move the Print dialog to the side, and the appearance of the email on screen will be a pretty exact rendering of how that particular email will look once printed. Since the Print dialog is opened as a "modal" window, it will not let you get to the printer-friendly email window to access Print Preview from the File menu, as you are accustomed to doing on the web. So, to actually print the email, all you have left to do is click the Print button or hit Enter on your keyboard (to print the email using your default printer), or select another printer and do the same. The print-version of your email is optimized for print output on paper: it does not use colors, except for those actually contained inside the email body, and hides all but the necessary information: email sender, recipient, date, subject line - and the email content. The only other pieces of information that will find their way onto the printed email are added by your browser, and can be configured through the web browser's print settings. Yahoo also lets you use the Ctrl+P keyboard shortcut to print an email currently opened in its own tab. The same "semi" print preview window will open, and your operating system' Print dialog will popup on top of it, letting you choose the printer and print the email, or cancel and return to your Yahoo Mail account. 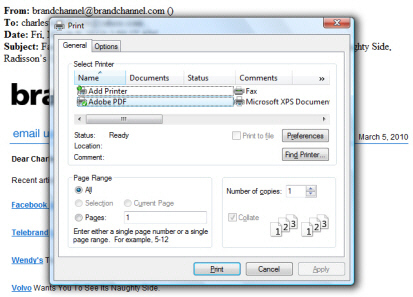 Can I print multiple emails at once in Yahoo Mail? At this time, Yahoo does not support print multiple emails at the same time, so you will have to print each email individually - hopefully you were not trying to print your entire inbox!